Esoteric Anatomy offers a spiritual approach to massage, bodywork, and somatic psychology, demystifying an ancient transpersonal model for understanding energy in nature and working with consciousness in the healing arts. on human energy dynamics and energy medicine. "When I hold this text, I feel as though I am holding one of the more important documents of our time--an extremely comprehensive and extraordinary map of our subtle anatomy.... Bruce has mindfully woven insights from the wisdom of ancient India to create a unique approach for understanding and working with life force, the healing presence of the soul." "The first section of this book, "Loving Hands Are Healing Hands," contains a series of energy-balancing sessions based upon Polarity Therapy. While quite simple and easy to learn,.. [they] are profoundly effective. Then, through a holistic approach to healing, Bruce presents a system of somatic psychology for cleaning trauma from the cellular memory of the body. " 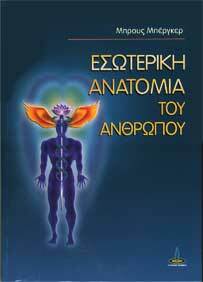 "Esoteric Anatomy is a thorough and scholarly exploration of "Energy in the Healing Arts." Bruce Burger's long experience in the field and sincere dedication to integrating spirit with physical and emotional health are reflected on every page. This book is a significant addition to holistic-health literature, and the Polarity Therapy community. " "With Esoteric Anatomy, Bruce Burger integrates profound levels of Oriental wisdom and Ayurvedic theories of creation and transformation in a new and convincing way. The implications are completely transforming for every type of body therapy as well as the healing arts in general." Bruce Burger, MA, RPP, RPE, is the founder of Heartwood Institute, which was one of the world's leading centers for professional training in massage and somatic psychology. Located on 200 acres outside Garberville, California, Heartwood is served for over thirty years as a utopian community and educational institution. Bruce holds degrees from the University of Pennsylvania and the New School for Social Research. He has been a member of the faculties of the University of Nevada and Rutgers University. Over the years he has been blessed with opportunities to study the Sanatana Dharma (East Indian Philosophy). Bruce has devoted his life to exploring natural healing and human potential. 426 8 x 10 pages. Published by North Atlantic Books, Berkeley, 1998. U.S. EDITION NOW BACK IN PRINT ! 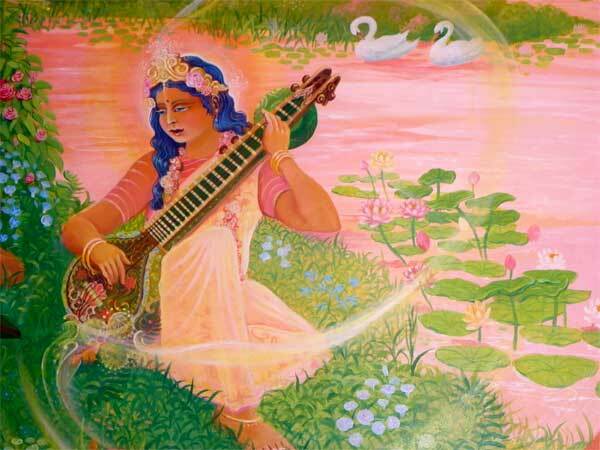 The goddess Saraswati "Essence of Self" playing the music of creation. The Soul is a unit drop of the ocean of Eternal Spirit which is the dweller in the body as the knower, seer, doer; it experiences all sensation and action. It alone is the power in the body which reacts to any mode of application of therapy or action. Consciousness and intelligence reside within the Soul. In recent years many traditions of transpersonal psychology have been brought to our attention in the West. Yoga, union with the higher self, has become a household word. Westerners are practicing a myriad of techniques of yogic Self-cultivation. Yoga psychology has been systematically formulated and practiced for millennia. Its efficacy for healing and for the acceleration of personal evolution has been replicated over thousands of years. In this essay, our goal is to make clear a model of esoteric psychology which underlies yogic practices. Our intention is to illuminate an ancient model for the practice of energy medicine and to underscore the appropriateness of Polarity Therapy for the practice of somatic psychology. 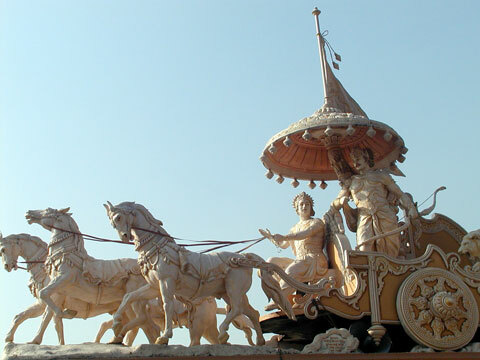 The most lucid of the esoteric traditions which inspire the Polarity paradigm is the Sanatana Dharma, the timeless philosophy of ancient India. The Sanskrit term Sanatana, which is often translated as "eternal," means "prior to time." Dharma, which is often translated as "righteousness, religion, or law," comes from Sanskrit roots which mean "to uphold". It relates to a way of living that unites one with the Transcendental Self. The wisdom of the Sanatana Dharma has its foundation in the principle of advaita. This Sanskrit term means "not two." The doctrine of advaita asserts an identity of all-consciousness, a vision of the universe as one living conscious being. There was never a time when I did not exist, nor you . . . Nor is there any future in which we shall cease to be. As Above So Below . 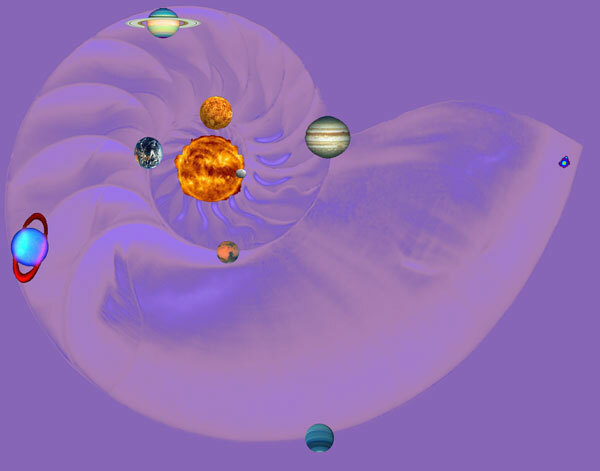 . .
in our solar system that we find in a Chamber Nautilis. Above & below sustained by the one life breath of our living universe . . . The Sanatana Dharma reveals that we exist in two dimensions-a dimension of Spirit and a dimension of matter. Our five senses are exclusively attuned to the dimension of matter. Spirit, which transcends matter, is the source of our consciousness and aliveness. The body is an emanation of Spirit. It is the body's attunement with Spirit that sustains life. Derived from the Latin spirari, meaning "to breathe," spirit is the breath of life. The body is lifeless and unconscious without its presence. In Sanskrit the word Atman, the portion of the Divine which supports individual existence, is also from the verb root at, meaning "to breathe. "26 When the body falls out of harmony with spirit, we are left with a corpse which begins to decompose immediately. Without Atman, which in the West we call the Soul (the animating force), the body is seen as something unclean and decaying, to be disposed of as soon as possible. It is only the presence of Spirit that gives this mortal coil value. In the Sanatana Dharma, Spirit, the animating force in the body, is transpersonal and exists in a timeless dimension beyond the body and outside the cycle of birth, death, and decay.27 The spiritual dimension is an all-pervasive field of living, breathing, cosmic consciousness, beyond description and beyond change. Spirit is immutable. Dr. Stone referred to Spirit as The One Life. The Sanatana Dharma offers us a transpersonal paradigm. The universe is one living sentient being. In The Bhagavad Gita, Sri Krishna explains: "Know this body to be the 'field' and know me to be 'the Knower' of the field. Know also that I am the sole knower of all fields, of all bodies." In the cosmology of the ancients, all creation is a play of the consciousness of One Being. Creation is a moment-to-moment appearance within this One Transpersonal Being. Dr. Deepak Chopra, referring to Ayurveda, the ancient healing science based on the Sanatana Dharma, explains: "Ayurveda's great contribution was to see the physical body as an epiphenomenon of consciousness. Consciousness shapes, controls, and even creates matter. "32 "The body, the vital energy, the sense organs, the mind, the intellect and the ego-these are the coverings of the Atman. "33 All the material energy fields of the body are emanations from this innermost yet all-pervasive center whose presence is the sentience and awareness in the body. At the nucleus of every atom, molecule, and cell of the body is an energy field of a higher potential which is in tune with the spiritual realm. This is the animating principal of the body, the Soul.34 The physical field is a radiation into time and space from the nucleus of the Soul. Matter and energy are an emanation of Spirit.35 Creation is a field of consciousness. Matter is a crystallization of consciousness. The ancient wisdom offers us a sacred science. The laws that rule the crystallization of spirit into matter are universal. The word that is God. And am potent in man. God Becomes the World . . . The universe and nature are aspects of the Being of God. 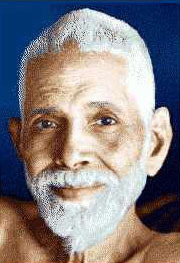 "God" as consciousness, Satchitananda (existence/knowledge/bliss), is wholly present as every level of creation. According to the Sanatana Dharma, God is the very stuff, the actual essence, of each and every stage/level. God, [or Brahman] is not the highest level, nor a different level itself, but the reality of all levels.39 "Brahman is Existence, Knowledge and Bliss; but these are not attributes. Brahman cannot be said to exist. Brahman is existence itself. Brahman is absolute and infinite-the eternal, immutable, illimitable, omniscient, formless Great Mystery: Being absolutely present, Brahman is within all creatures and objects. "40 Brahman is the Being in human beings. In the embodied creature, this Brahman is known as Atman. Deathless, birthless, Unchanging for ever. Living Universe . . . 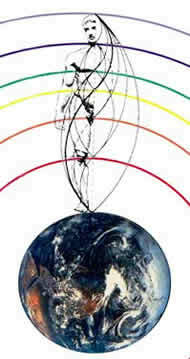 In every energy system there must be a fulcrum, a center of movement, or there is chaos. The Self is the natural center of our Being. It exists within each of us, as the source of our life and our consciousness. The Self is intelligence: a sentient, cognizant, self-organizing force. The body, mind, and senses emanate from this innermost Intelligence. We suffer from a chaos of identification with every object of the mind and senses, from a lack of connection to our Source. It is profoundly important to cultivate a relationship with the Self on a daily basis to clear the chaos of the mind. Relating to the fulcrum of Being offers us the opportunity to find a stable center for healing our lives. The Self is pure Being. It exists in a higher realm than the mind and five senses. It exists outside of time and space. Thus it cannot be grasped directly by the mind and senses. Yet it is always present as the ground state of our consciousness. The Self is the actual cognizer and intelligence which is present from moment to moment as our awareness. But our minds are too disturbed by chaos and obsession for us to experience this truth. Soul communion purifies the mind. The potency of the Unitive Field harmonizes the lower vibrational fields of the body and mind. We can commune with the Self through the creative power of our intention. Through a passionate desire to know the Self, we can build a vehicle within our lives that is receptive to our innermost essence. Daily practices such as contemplation and worship exalt our consciousness and foster the integration of the Self into our lives. The clarity and inner peace that one experiences through meditation and yoga offer this higher knowledge as does devotion and the rapture of worship. Gratefulness, service to life, and love of the Mystery all facilitate Soul communion. A personal experience of Divine Love can become the center of our lives and the basis of a genuine sense of Self-love and Self-esteem. Let go of any expectation of having a phenomenal experience. Union with the Self is supersensory-beyond the mind and senses. The process is one of evolving your consciousness through a day by day, organic process of Self-realization. We make the Self real in our lives by creating the space to be with the Self. We actualize our Higher Self by investing our life in it. The sages tell us: What your mind contemplates, you become! Every thought is a prayer! You build your world through your moment-to-moment thoughts, feelings, and desires. Passionately desire to know the Self. Take the energy you have invested in obsession with your pain and suffering and refocus it into a passion to be free! Move the energy which has been invested in the distractions and trivialities of life to an earnest quest for liberation! The eyes are the windows to the Soul. We can catch a glimpse of the Light of Life, the Presence, through the eyes. Many seekers have made a leap in consciousness through the simple practice of mirror work. It is valuable to take a few minutes each day, sitting in front of a mirror at eye level, to practice the classic "Who am I ?" contemplation, given to us by the great twentieth-century sage Sri Ramana Maharshi. I have a body, but I am not my body. and what can be seen and felt is not the true Seer. but that has nothing to do with my inward I.
I have desires, but am not my desires. and what can be known is not the true Knower. but they do not affect my inward I.
I have desires, but I am not desires. and what can be felt and sensed is not the true Feeler. I have emotions, but I am not emotions. I have thoughts, but I am not my thoughts. thoughts, emotions, feelings, and desires. For International book orders: Please buy e-book edition at Amazon.com or Apple's iTunes online stores. 1. R. Stone, Polarity Therapy: The Collected Works, Book II,he fir st pripal of Polarity Therapy, "Summary of Principles." 6. Dr. Stone writes: "The Vedas . . . have probably the most lengthy and accurate of all systems on the account of creation . . . The whole Vedic system is very comprehensive." Randolph Stone, Mystic Bible, (Beas, India: Radha Soami Satsang, 1977), p. 70. 7. Jean Le Mee. Hymns From The Rig Veda, (New York: Knopf, 1975), pp. ix- x. 8. Bloomfield; Religion of the Veda (1908), p. 55, in S. Radhakrishnan, The Principal Upanisads, (New York: Humanities Press, 1974), p. 17. 9. Prabhavananda and Christopher Isherwood, The Song of God: Bhagavad-Gita, (New York: Mentor Books, 1972), pp. 11-13. 12. Sir John Woodroffe, The World as Power, (Madras, India: Ganesh,1966), p. 158. Atman comes from the Sanskrit verb root at "to breathe." J. Tyberg, The Language of the Gods, (Los Angeles, California, East-West Cultural Center), 1970. p. 4. 13. Prabhavananda and Isherwood, Shankara's Crest Jewel of Discrimination, pp. 86-87. 15. Prabhavananda and Isherwood, Shankara's Crest Jewel of Discrimination, p. 87. 18. Brahman is the Sanskrit term for the Absolute, The Supreme Being, R. C. Zaehner, The Bhagavad Gita, (New York: Oxford University Press, 1969), p. 8. 19. Prabhavananda and Isherwood, Shankara's Crest Jewel of Discrimination, p. 104. 21. Prabhavananda and Isherwood, The Song of God, Bhagavad -Gita, p. 70. 22. N. Vasudevan, "Man and Pure Consciousness," The Mountain Path, (Tiruvannamalai, India: 1991), p. 124. 23. The Sanatana Dharma is not simply pantheistic, because it recognizes that God is beyond creation as well as within creation. 24. Paul Deussen, The Philosophy of the Upanishads, (New York: Dover, 1966), p. 195. 25. Prabhavananda and Isherwood, The Song of God: Bhagavad-Gita, p. 136. 26. Tyberg, The Language of the Gods, p. 101. 27. Spirit is infinite (Aparicchinna) and formless (Arupa). Arthur Avalon, The Serpent Power, (New York: Dover Publications, 1974), p. 26. 29. Epiphenomenon means a secondary phenomenon accompanying another and caused by it. 30. Ramcharaka, The Bhagavad Gita, (Chicago, Illinois: Yoga Publication Society, 1935), (parenthesis mine). 32. Dr. Deepak Chopra, "Ageless Body, Timeless Mind," Yoga Journal, Sep/Oct 93, p. 64. 33. Prabhavananda and Isherwood, Shankara's Crest Jewel of Discrimination, p. 110. 34. Stone, Book II, p. 3. 35. "Physical sciences inform us that the whole of creation is built up of layers of energy, one inside the other. The subtlest constitutes the innermost stratum of creation. Underneath the subtlest layer of all that exists in the relative field is the abstract, absolute field of pure Being. It is said that Being is the ultimate reality of creation. It is present in all forms. We may say that existence is life itself, while that which exists is the ever-changing phenomenal phase of the never changing reality of existence. Existence is the abstract basis of life on which is built the concrete structure of life." Maharishi Mahesh Yogi, The Science of Being and Art of Living, (Livingston Manor, New York: M.I.U. Press, 1976), pp. 25-28. 36. Avalon, The Serpent Power, p. 26. "Atman, the Supreme Knower in each and every one of us that is none other than Brahman, the sole and basic reality of the Universe . . ." Ken Wilber, The Spectrum of Consciousness, p. 87. 37. Prabhavananda and Isherwood, The Song of God: Bhagavad-Gita, p. 71. 38. Radhakrishnan, The Principle Upanisads, p. 82. Also, Eknath Easwaran, The Bhagavad Gita for Daily Living, Vol. I, (Petaluma, California: Nilgiri Press, 1979), Introduction. In this explication we tend to emphasize the profound eminence of God yet we will at the same time constantly bow to the transcendent as well. 39. Please appreciate that we are not being pantheistic. While we emphasize that Brahman is the world, or the sum total of the universe, we do not overlook the equally important fact that Brahman is radically prior to the universe. See Ken. Wilber ed., The Holographic Paradigm, (Boston, Massachusetts: New Science Library, 1982), p. 255; Wilber, The Spectrum of Consciousness, p. 88. 40. Prabhavananda and Isherwood, The Song of God: Bhagavad-Gita, p. 131. 42. "The Greek word phusis-the root of our modern terms physics, physiology, and physician-as well as the Sanskrit Brahman, both of which denoted the essential nature of all things, derive from the same Indo-European root Bheu [to grow]." F. Capra, The Turning Point, (New York: Bantam, 1982), p. 214. 43. For the ancients the creator was an all-pervasive consciousness that was as near to us as our own life breath. Thus we define prana as the intelligent force which is the living breathing presence of the living intelligence of the one living being of universe in the subsystems of nature and man. 44. Prabhavananda and Isherwood, The Song of God: Bhagavad-Gita, p. 70. 45. Stone, HB, p. 7. 46. Ken Wilber, No Boundary, (Boston, Massachusetts: Shambala, 1985), pp.128-129. Esoteric Anatomy "The Body As Consciousness"
Esoteric Anatomy "The Body As Consciousness" may very well be the first epic of energy medicine. From discussions on sound waves and energy to practical bodywork protocols Esoteric Anatomy has it all. Esoteric Anatomy presents Polarity Therapy in the larger context of Energy Medicine. To accomplish this Bruce Burger takes the reader through a basic understanding of Polarity Therapy and than into advanced concepts of energy, sound, and somatic psychology. From a Polarity Therapy teachers perspective I enjoyed the first section of the book, "Loving Hands Are Healing Hands" because it presents the learning of Polarity Therapy in a unique and creative way. Of special interest were eleven protocol sessions designed to teach basic Polarity Therapy competencies to beginning and advanced students. I am looking forward to using the protocols with my students. After reading the section I was left with the wonderful thought that there are thousands and thousands of ways to learn Polarity Therapy and the joy of experiencing the creativity and guidance of a master teacher presenting his unique method of instruction. The next section, "Essays on Esoteric Anatomy" seemed to be written just for me. From The Theory of Theomorphic Resonance to The Golden Spiral to The Omnipresent Cosmic Person to Sound Is The Temple of the Spirit I felt as though I was eating a wonderful bowl of colored mystic jelly beans. Of course the next section, The Practice of Somatic Psychology, brought me back to earth. In this section Bruce discusses the body/mind relationship and practical methods of practice and evaluation. This is a very good section and necessary to ground out his "Essays on Esoteric Anatomy". I assume it was written so that readers like me could drive home safely. I believe that Bruce Burger has made a tremendous contribution to the field of Polarity Therapy and the larger field of Energy Medicine. Esoteric Anatomy is truly a labor of love. There is something for every reader from beginning to advanced to learn and enjoy. 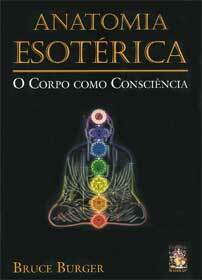 I highly recommend Esoteric Anatomy to all those interested in Polarity Therapy and Energy Medicine. Dr. John Beaulieu, N.D., Ph.D. Author of Music and Sound In The Healing Arts and The Polarity Therapy Workbook.